Wonderland platform for European architecture is selecting the most innovative projects, realized or not, to participate in the workshops and discussion tables at the event. Participants may also be chosen to be a part of Architect in Residence Program. The most relevant criteria for selection will consider the conceptual potential of the drafted scenario or research field; innovation of design and research methodology; social and spatial impact; inclusion of stakeholders and participation strategy. The workshop will take place within august 8th and 15th and selected teams must be present at all days. Selected projects will be provided with up to €6.000; all travel expenses within Europe, as well as accommodation and boarding expenses will be covered by Wonderland. 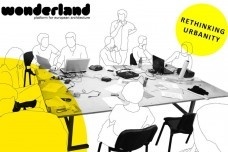 To subscribe projects applicants must file in the application form, a questionnaire developed by Wonderland, an office presentation and the project proposal. They can be accessed through the project’s website or downloaded here.